The Woman In Black evokes chills right from the beginning; when 3 little girls playing "tea-time" kill themselves by mysteriously jumping off a window, effectively setting the tone for this spooky yet understated horror flick. 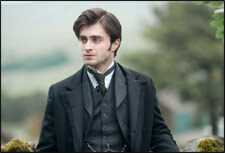 But the movie's charm revolves around its central character, Daniel Radcliffe (as the young, tormented Arthur Kipps), and the quiet way the script goes about creating a sense of evil-at-large. Arthur Kipps, a laywer and a widower who hasn't yet gotten over his wife's death, lives with his young son, Joseph (Misha Handley), in London. As a last-ditch attempt to save his sinking career as a lawyer, he is assigned to take care of the countryside estate, and the paperwork of a widow who has recently died. En route to the village, Kipps meets Mr. Daily (CiarÃ¡n Hinds), who's from the same village as the dead lady. Kipps arrives at the village, only to realize that he's unwelcome. The villagers avoid him, and their children are not allowed to be around him. With great difficulty, he finds transport that will take him to the lady's estate - an isolated piece of land off the mainland, surrounded by mists and marshes. This particular setting is beautifully done, and seeing the vast stretches of desolate marshland is enough to get people sit up in their seats out of anticipation. Around the time that Kipps reaches the estate, the spooky quotient of the movie goes up a few notches, as an apparition, the title character of the move, makes her presence felt. Surprisingly enough, Kipps is only curious (as opposed to at least mildly terrified) and goes about his business until dusk, when he heads back to the village. In the village, he accepts an invitation for supper with Mr. Daily and his wife. It is here, when he meets Mr. Daily's wife and witnesses the scene when her dead son takes over her body to start drawing on the table, that Kipps gets an inkling of the evil that seems to have gripped the village. Back in the estate the next day, Kipps goes through the dead lady's letters, and learns that her son was killed years ago after drowning in the marsh, and that his body remained unrecovered. Further incidents in the village, where children seem to be getting killed all too often, the villagers' superstitions about the lady in black, and Kipps's meeting with Mrs. Daily, reveal a link that puts Kipps bang in the middle of it all. Fortunately, the film doesn't rely on gore to chill its audiences. Instead, it uses every piece of furniture, toy and person in the movie to create the desired effect. Watkins manages to keep a tight leash on the settings and performances to keep his audiences inextricably bound to the screen, and the background score only serves to accentuate the feeling that your tormentor is right behind you. Daniel Radcliffe has a chosen well to shed his Harry Potter image. He plays his character with maturity and restraint, and shoulders the movie ably. CiarÃ¡n Hinds, too, blends perfectly into his character as the patient husband and Kipp's only friend in the village. No gore, no mindless screaming, just a lot of subtle watch-your-back, and look-right-and-left kind of chills - this is a movie that is a welcome respite from the spate of rom-coms. And as a bonus, you get to see Harry Potter come of age. Be the first to comment on The Woman In Black! Just use the simple form below. fullhyd.com has 700,000+ monthly visits. Tell Hyderabad what you feel about The Woman In Black!